Girls Wear Blue Too: The best things in life are free! Some of the loveliest things that came into my home this week were free. We took a walk earlier this week to the local shops to do some posting and buy some Veges. As usual there was a Massive quantity of various goods dumped on the ground outside the charity bins by the car park. This really drives me nuts ( but that's another story. ) 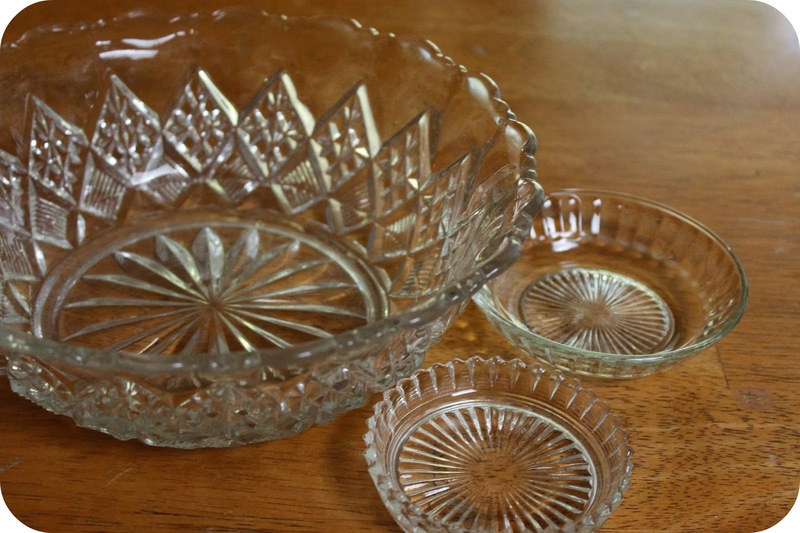 On this day there was a big under bed storage tub filled to its brim with Vintage glass bowls and pin dishes and I took some. I do wear mild guilt associated with doing this - taking things that were intended for a charity, though I justify my wrong doing by thinking about the broken pieces I saw on the ground near by and knowing that I have saved these pieces from a potentially similar fate. I have such a weak spot for the beauty cut glass. The large bowl is not something that is precisely to my taste, its a little too fussy in its patterning though in a time when I am de-cluttering, rearranging and organising like a woman possessed, I chose this bowl over its finer companions for its practical aspects of size and depth. I do adore is pretty scalloped top edge and think it is a perfectly lovely piece. Judging by the scrapes on its internal base it has been used as a mixing bowl in its past. 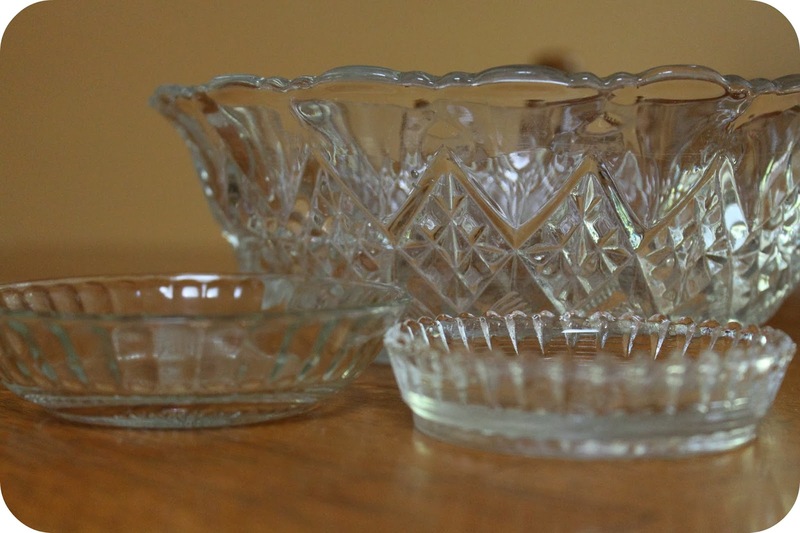 There is not a single aspect of either of the pin dishes that I don't adore, the larger one is already in my bathroom cabinet holding hair pins and I think the smaller one is destined for my studio. 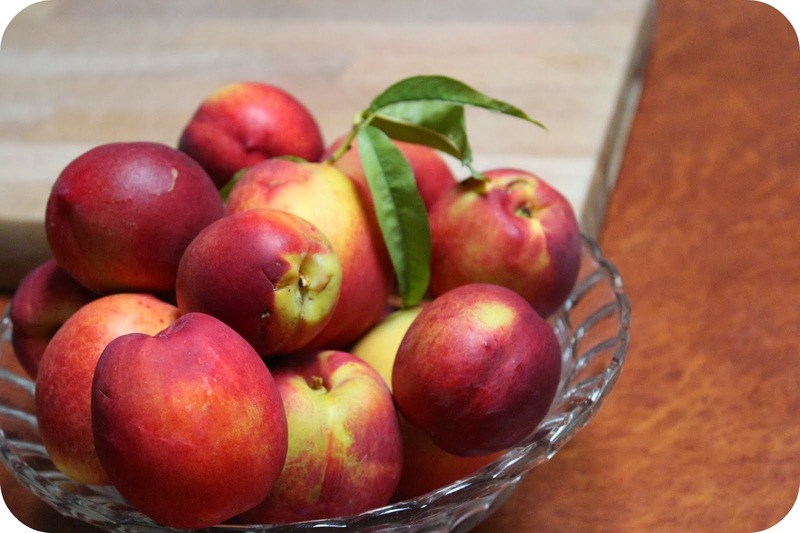 At home I harvested the Nectarines. In previous years we have not gotten a good crop from this tree and the birds have taken the small amount of good fruit, this year the cockatoos were feasting and I headed out to get what was left for us, this bowl shows about 1/3 the fruit I have now. The tree seems to be in generally better health than I have seen it and I am wondering if it is because it got less water this year, does anyone have experience with Nectarines? The Children head back to School in the first week of Feb and that is the direction my focus is starting to go in now, the preparation, planning and organising for that first week back We will have quite a different School routine happening this year and I'll be back to tell you about it soon. Wishing a Happy Thursday to all my lovely readers. Nice find, they are lovely! Luckily I was walking Jo or I may have bought a few more treasures home with me! I get hot under the collar too when I see on the news how much 'rubbish' is left outside the charity shops and I can't understand the mentality of people who do that. Why not just take one's rubbish to the local dump? Love the nectarines and your bowls, Tammy. I totally agree it really drives me crazy when I step over bags of donations to put my own in and mine drops in easily, for goodness sake people its not that much extra effort.